﻿﻿﻿﻿​Poker players in the United States have been deprived of a real money poker app for the past couple of years. Finally Americas Cardroom and BlackChip Poker have released a United States friendly real money poker app for iPhone, Blackberry, iPad, Android and Windows Phone. ﻿﻿Playing poker on your phone has long been a problem for players based in the US. Apple's refusal to offer downloads of real-money gambling apps from the US version of the App Store on iTunes meant that Americans were unable to play poker from their iPhone or iPad for many years. The good news is legal poker apps are finally available in North America. 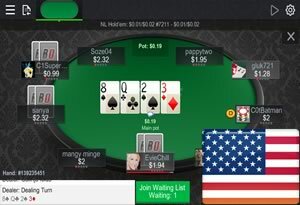 Internet poker remains a contentious issue in many US states so you still can't download your favourite PokerStars or Full Tilt app from the Apple App Store. Thankfully a number of online sites have now developed mobile poker clients that can be played instantly on any device that has a browser and an internet connect. Simply browse to any of the sites listed below from your iOS, Android or Windows Phone device and you can start playing cash games, tournaments or fast-fold poker without the hassle of having to download any software. Deposits can be made quickly and easily via credit cards, cash transfers or Bitcoin. 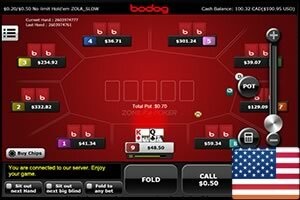 Bovada poker is once again available in the United States and is now part of the PaiWangLuo network. 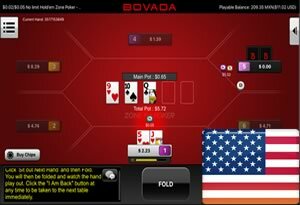 Bovada Mobile Poker works on any iOS or Droid and offers a variety of Texas Hold'em, Omaha Hi/Lo and Omaha Hi cash games. Bitcoin is accepted in addition to all major credit and debit cards. BetOnline is currently the only mobile poker option for U.S. players who want to play Sit & Go's and MTT's on their mobile devices in addition to Omaha and Hold'em cash games. BetOnline for iPhone, Android and iPad can be played instantly via any browser and they accepts players from all 50 states. Bovada Poker has moved to Ignition Poker. Both the mobile and desktop software is exactly the same and you still have the benefit of playing at one of the biggest poker networks. Play Texas Hold'em and Omaha cash games on your iPhone, Android or iPad in the United States of America. Carbon has become one of the dominant players in the US online poker market following the departure of PokerStars, so it's not surprising that they've developed the first and best mobile compatible site for iOS and Android. Both Texas Hold'em cash games and Sit & Go tournaments are on offer. No download required. Americas Cardroom have one of the best PC and Mac poker clients but until recently it was impossible to play real money poker at Americas Cardroom on your Android or iOS device. 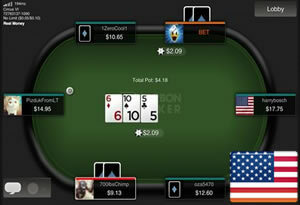 ACR player can now play Texas Hod'em Jackpot tournaments from their mobile devices. Bovada Mobile Poker Is Now Available In Mexico, Brazil, Agrentina and the U.S. It seems a heck of a long time ago from the ‘boom’ years of the online gambling industry. The early to mid-2000’s saw an unprecedented amount of online gambling sites pop up from all around the world, but it was the US that really lead the line. 2006 saw the introduction of the Unlawful Internet Gambling Act and the crash in 2008 was a colossus one and some very, very dark days for a huge number of people from within the industry lay ahead. But, 2013 seemed to be the first year since the crash that online gambling within the US saw a little light at the end of the tunnel. Whilst the online industry was outlawed throughout the US, two states managed to successfully get this prohibition over turned in the form of Nevada and Delaware. They got state licenses offering the use of online gambling to anyone who lived or was visiting each respected state. As yet, development has been slow from both, but early 2014 saw yet another break through. New Jersey was the third fully licensed state to be granted a license, except this time they were a lot more proactive. They teamed up with Virgin Casinos and from there have laid plans a foot to bring in a number of online gambling retailers to trade from within their state. The fact that New Jersey has been so proactive in their approach – compared with the other two licensed states - will likely be a huge step forward for online gambling throughout the US. The numbers thrown about are astronomical with an estimated $1billion in revenue coming just from gambling alone in the state of New Jersey. THE LEGALIZATION OF ONLINE POKER, SPORTS BETTING & CASINOS SPREADS ACROSS THE U.S. The domino effect simply has to follow this and we are likely going to see a lot more states following suit in the not too distant future. Talks of California submitting an application have already been muttered and many more will likely follow. 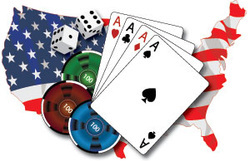 The big question is, can online gambling in the US get back to where it was? A very tough question to answer as this very, very early stage, and we may not know the answer to this for another five years or so. But, there are positive signs moving forward for the US and with each successful application will make any number of states starts to sit up and take note. Google Android smartphones and tablets are open environments so lawmakers aren't able to stop U.S. citizens downloading and installing bookmaker, poker, bingo or casino apps. Even though real money gambling apps aren't listed in Google Play, Samsung Galaxy or HTC One users can still download the apk files directly from the gambling companies website and start wagering for real money. The current legislation doesn't work because thousands of Americans gamble every day from their computers or mobile devices. It's estimated that the U.S. market is currently worth in excess of $10 billion, most of which leaves the country and goes straight into the pockets of off-shore companies who pay zero tax. Advances in HTML5 games development has meant that gambling companies can now develop web based apps that are every bit as sophisticated as the ones you download from the iTunes App Store. Many governments hoped that they could use geo-location features in both iOS and Android handsets to prevent real money gambling apps being activated in their countries. Since these new HTML5 web based apps are played from your phones Safari or Chrome browser, it is impossible to prevent users accessing them using GPS. An excellent example of how this technology is deployed is the new U.S. friendly Carbon Poker Mobile Client which works on any iOS, Windows Phone, BlackBerry, Nokia or Android device.